Winner of the Wolfson History Prize, Christopher Clark's Iron Kingdom: The Rise and Downfall of Prussia 1600-1947 is a compelling account of a country that played a pivotal role in Europe's fortunes and fundamentally shaped our world. Prussia began as a medieval backwater, but transformed itself into a major European power and the force behind the creation of the German empire, until it was finally abolished by the Allies after the Second World War. 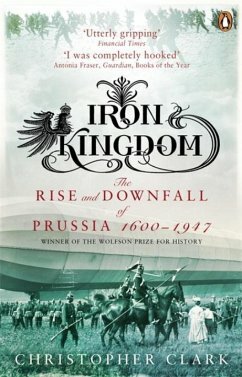 With great flair and authority, Christopher Clark describes Prussia's great battles, dynastic marriages and astonishing reversals of fortune, its brilliant and charismatic leaders from the Hohenzollerns of Brandenburg to Bismarck and Frederick the Great, the military machine and the progressive, enlightened values on which it was built. 'Fascinating ... masterly ... littered with intriguing detail and wry observation' Richard Overy, Daily Telegraph 'A terrific book ... the definitive history of this much-maligned state' Daily Telegraph Books of the Year 'You couldn't have the triumph and the tragedy of Prussia better told' Observer 'A magisterial history of Europe's only extinct power' Financial Times 'Exemplary ... an illuminating, profoundly satisfying work of history' The New York Times Christopher Clark is a lecturer in Modern European History at St Catharine's College, University of Cambridge. He is also the author of Kaiser Wilhelm II: A Life in Power. Christopher Clark is a lecturer in Modern European History at St Catharine's College, University of Cambridge. His previous book was a biography of Kaiser Wilhelm II.